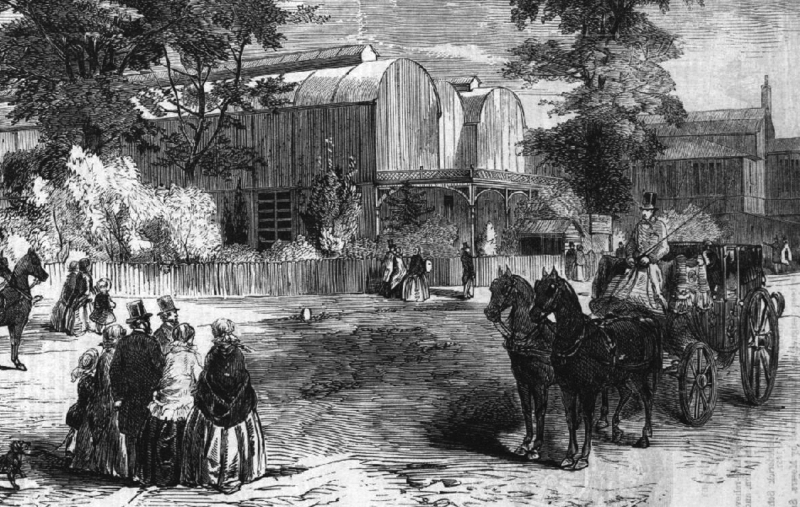 In Victorian Britain, iron buildings were being exported all over the world, from South America to Australia, demonstrating (and actualising on the ground) the country’s expanding imperial ambitions. The very first buildings for export were made from timber, an early example being a portable hospital sent to a penal colony in Australia in 1790. As the constructive potential of cast and wrought iron began to be developed in structures such as bridges, mills and warehouses, so timber was gradually substituted for iron in many buildings for export. By mid-century, the manufacture of prefabricated iron buildings for the colonies had become a commercial enterprise, with houses, churches, hospitals, warehouses and factories exported in large numbers by specialised iron founders like Samuel Hemming, Edward T. Bellhouse, Richard Walker, John Porter and Charles D. Young. 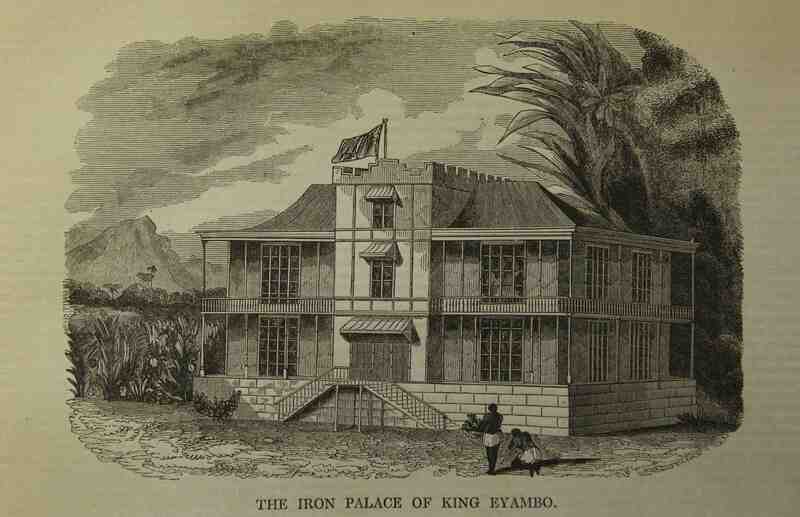 The majority of these early prefabricated iron buildings were utilitarian in design, such as William Laycock’s iron palace for King Eyambo in British West Africa (1), which was erected in 1843 and opened for public exhibition in Liverpool before being exported. Widely reported in both local and national newspapers, this building exemplified a utilitarian ‘rational style’ in iron, although its metal plates and panels of were here mounted over a wooden skeleton. The Illustrated London News celebrated the iron palace as a rare example of the principles of construction dictating style, the reverse being the ‘prevailing view‘ in most early Victorian buildings. 2. The Brompton Boilers as depicted in the Illustrated London News, 1857. However, this appreciation of unadorned utilitarianism in iron construction was short-lived, particularly after the construction of the so-called ‘Brompton Boilers’ in 1856 (2), which were actually temporary buildings for the South Kensington Museum, designed and manufactured in Scotland by Charles D. Young. Consisting of a long rectangular iron covered by three elliptical roofs clad in corrugated iron, the building was vilified in the building press. In a reversal of the earlier celebratory imperial rhetoric connected with iron buildings like this, The Builder argued that ‘no New Zealander savage would erect such a structure so utterly and indefensibly ugly’. 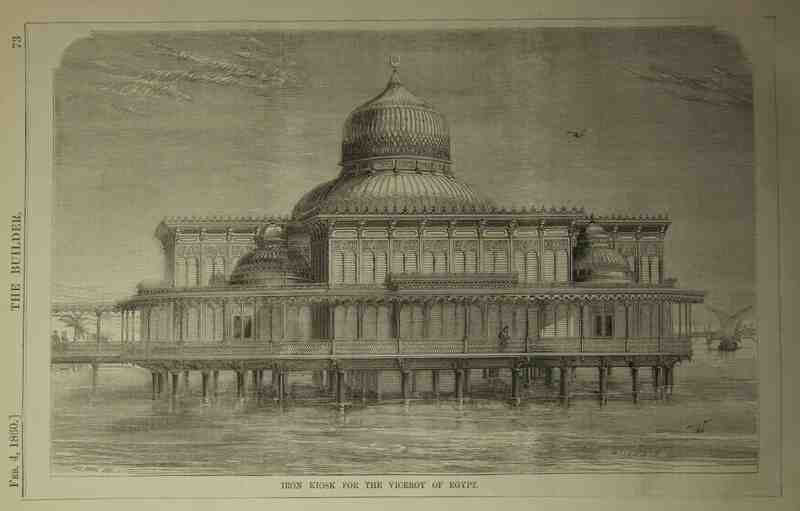 The central problem for The Builder and others was the context of this building: despite being intended as a temporary structure, it was nevertheless expected, as a public building, to symbolise, through ornament, the architectural values of high culture (particularly as it would house a national collection of ornamental art). Thus, its blank walls were ‘offensive’ to The Builder because they symbolised nothing, its arched roofs breaking the rules of architectural decorum by resembling ‘three huge boilers placed side by side’ rather than any recognisable civic building. As if responding to the harsh criticism of his handiwork, the manufacturer Charles D. Young explained in the introduction to his 1856 catalogue that founders like himself were now seeking input from architects in the design of prefabricated buildings to provide ‘greater scope for the display of architectural effect’. One of the first publicly exhibited prefabricated buildings to demonstrate this shift was a bathing kiosk for the Viceroy of Egypt (3), designed by the engineer Robert Stephenson and manufactured by the London founder Henry D. Grissell, and erected on the Isle of Dogs in the summer 1858 (but still there in early 1860, its eventual fate unknown). Consisting of a series of ‘comforts and luxuries peculiar to Imperial Oriental life, including baths and divans’, the structure was based on a Greek cross plan with a lofty central dome surrounded by four smaller domes, the whole structure standing on a vast circular platform 120-feet in diameter that was supported over the water by a grid of 60 cast-iron columns. Its ornamentation was described as both ‘Oriental’ and ‘Saracenic’, the exterior elements made up of cast-iron filigree panels picked out with colour, the interior comprising painted glass in the domes, encaustic tiles in the walls and a ‘richly-ornamented chain’ from which the baths were suspended. As The Building News recognised, the kiosk was an effective advertisement for both designer and founder, its cast-iron ornament being ‘amongst the best samples we have seen’. In addition, its Saracenic style articulated what was perceived to be an enlightened imperial relationship between Britain and Egypt. If the kiosk demonstrated ‘the enlightened liberality and cultivated taste’ of the Viceroy of Egypt, it was also, for a time at least, an exotic vision of the orient in the heart of London. As described by The Illustrated London News, ‘if we conceive the brilliancy of an Eastern sun, and the clearness of an Eastern atmosphere, we may imagine the effect of this kiosk glittering with its reflection in the waters of the most classical river in the world’. 5. 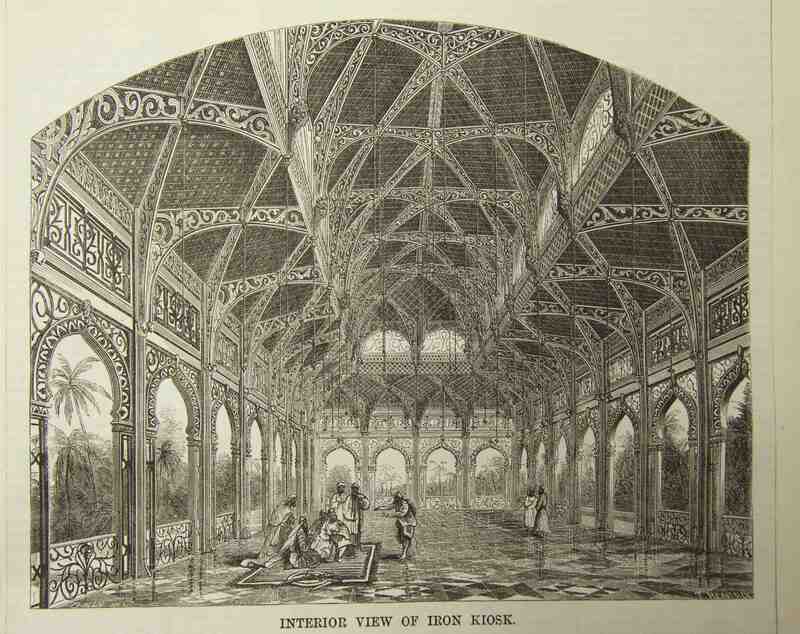 Interior of the iron kiosk for export to Bombay, The Builder, 1866. In the autumn of 1866 another ornamental cast-iron kiosk was erected and displayed in London, this time on the site of the former International Exhibition in South Kensington, in preparation for export to Bombay (4 & 5). Just like its Egyptian predecessor, this kiosk failed to reach its destination, remaining in London until at least until the summer of 1869, apparently a victim of the 1866 international financial crisis. A result of the collaboration between the architect Owen Jones, the engineers Roland Mason Ordish and William Henry Le Feuvre, and the ironfounder Andrew Handyside, the kiosk consisted of an open cast-iron structure with a 10-foot grid of columns joined by ogee-shaped arches and surmounted by a diagonal lattice roof comprised of dozens of arabesque panels. The ornamentation was created by an all-encompassing structural approach only possible with cast iron, with the more utilitarian elements (the bolts in the roof structure and wrought-iron structural girders) ingeniously hidden so as not to compromise the ‘light appearance of the structure’. This subjugation of structure to ornament demonstrates just how much the design of prefabricated iron buildings had changed since the 1840s, this particular example not only being ‘one of the most elaborate examples of ornamental iron work ever seen’ but also serving as an effective advertisement for Handyside’s work and the company’s aesthetic ambitions. 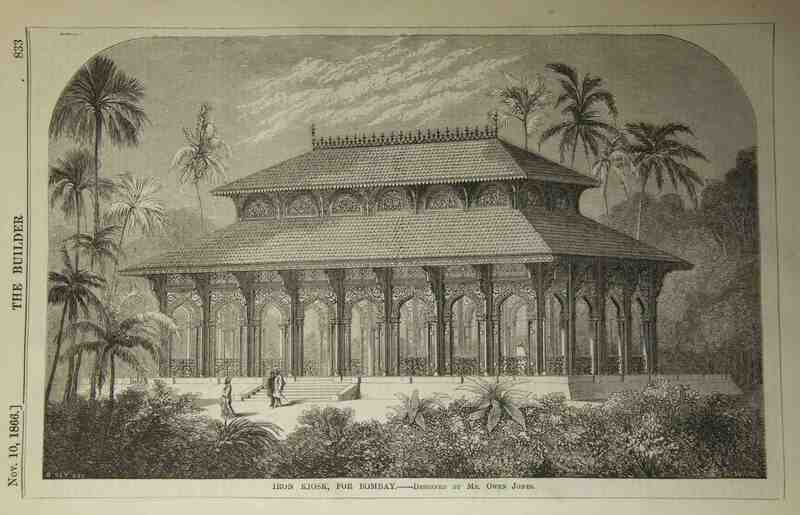 Yet, as the illustration in The Builder showed (5), this kind of elaborate orientalist ornamentation was also tailored to its intended geographic and climactic context – an imagined exotic, tropical site in India – and used by an equally exotic Indian aristocracy indulging in luxurious leisure. In this way, this kiosk was not only exporting an exemplar piece of English structural and ornamental ironwork, but a vision of how England imagined the exotic otherworld that it laid claim to. Enjoyed reading and finding some hidden gems of prefab iron buildings, particularly the Iron Bathing kiosk for the Viceroy of Egypt. An interesting post, similar in content to the talk that Jonathan Clarke gave at the ‘Function and Fantasy’ conference a year ago. Its a fascinating subject. Yes, thanks. Partly inspired by Jon’s talk actually. Many of these buildings remain enigmatic and not really written about in any detail.